Writing in this newspaper last month, economist Ajit Ranade made a case for scrapping 1,000 and 500 notes. Citing research by former Standard Chartered Plc chief executive Peter Sands, Ranade argued large denomination notes are highly likely to be used for illegal activities and not so much as a medium of ordinary transaction, and elimination of such notes can go a long way in cutting the stocks of such funds (popularly known as black money in India). A few days ago, the European Central Bank (ECB) announced that it was considering demonetization of the €500 note, while the former US treasury secretary Lawrence Summers wrote an op-ed in The Washington Post asking for a stop to further issuance of the $100 note. The reasons cited were similar—that such notes are too large to be used widely in day-to-day transactions, and instead end up serving the purposes of terrorists, tax evaders, money launderers and other criminals. While Ranade makes valid arguments, what they fail to take into consideration is the cost of scrapping these high-value notes. According to data put out by the Reserve Bank of India (RBI), the share of ₹ 1,000 notes in the stock of currency in circulation at the end of financial year 2014-15 was a whopping 39%, with ₹ 500 notes accounting for a further 45% of currency stock. 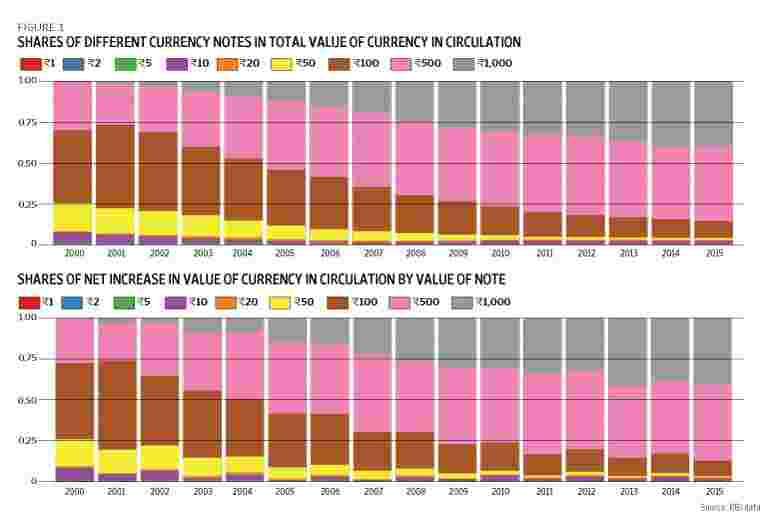 As figure 1 shows, the share of large value notes has only been increasing over the years. In the year 2000, for example, before the ₹ 1,000 note was reintroduced (it had been demonetized in 1978), ₹ 500 note accounted for only about 30% of the total currency in circulation. By 2015, large-value notes (of face value more than ₹ 100) accounted for more than 84% of the money in circulation. If we look at the net incremental currency added by denomination (each year RBI issues new notes of different denominations while retiring old notes that are soiled or torn), the share of large value notes is more stark—net addition of ₹ 500 and ₹ 1,000 notes in 2014-15 accounted for over 86% of all notes added. (The actual value of notes printed of these denominations might be lower as such notes are less likely to be retired compared to currency of lower denomination). 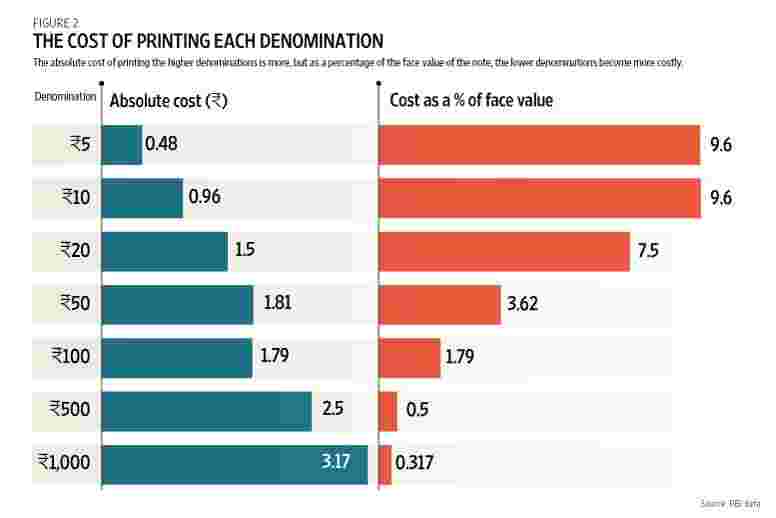 For example, cost of printing a ₹ 10 note was ₹ 0.96 (according to the data), or 9.6% of face value. The cost of printing a ₹ 1,000 note ( ₹ 3.17), on the other hand, was only 0.32% of the face value. In other words, for a given amount of money, it costs the RBI 30% less to print it in the form of ₹ 1,000 notes than in ₹ 10 notes. In 2014-15, the cost of printing the incremental notes of ₹ 500 and ₹ 1,000 denomination (assuming that no notes of these denominations were decommissioned) was ₹ 2,770 crore (based on the printing costs revealed by RBI). That year, the total stock of ₹ 500 notes in circulation increased by ₹ 3.59 trillion, while that of ₹ 1,000 notes increased by ₹ 3.076 trillion. If all this additional money (a spectacular ₹ 6.666 trillion) had to be printed using ₹ 100 notes, it would cost RBI about ₹ 11,900 crore, which is more than a four-fold increase. This is without taking into consideration the increased costs of operating ATMs (since they would need to be refilled more often), and of handling money in general. In other words, there is a significant cost to stopping issuance of ₹ 1,000 and ₹ 500 notes, as advocated by Ranade, and these costs should be weighed against what misuse of high-value notes costs the economy, before we make a decision. Even then, demonetization is not going to be as simple, as The Economist explains in its note on the topic: “Any withdrawal would have to be slow: central banks worry that putting an expiry date on cash could undermine the value of the currency. This will disappoint those who hope that eliminating high-value notes would prompt awkward conversations between criminals and the authorities. There is political resistance too; some worry that abolishing high-value notes is a step on the road to abolishing paper money altogether. And, without coordinated withdrawal of all high-value notes, the move would be much less effective." 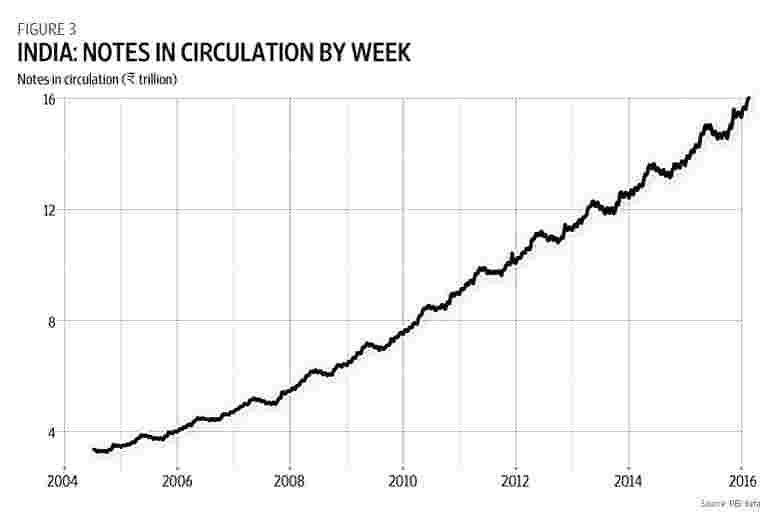 Finally, the RBI also puts out weekly data on the total stock of currency notes in circulation in the economy. This data shows some interesting patterns. While the overall amount of currency in circulation is on the increase, there is a weird pattern to it, as we can see in figure 3. Table 1 shows us the minimum possible amount of currency decommissioned each year along with the total currency in circulation at the end of the year. 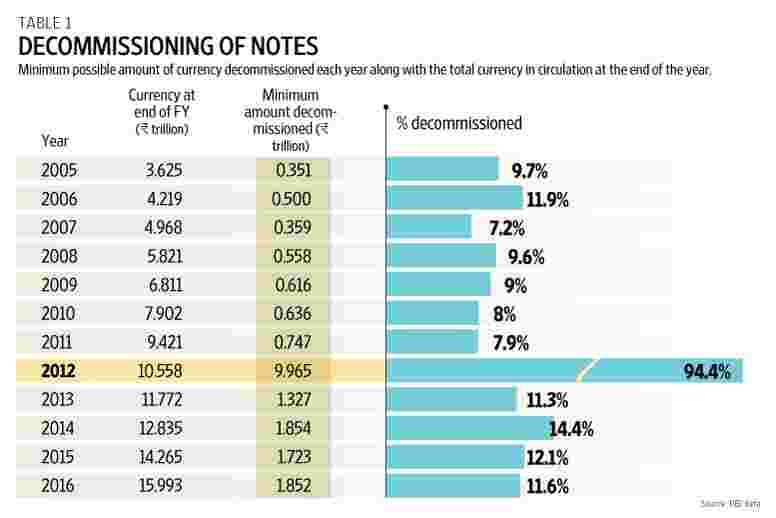 Since each of these numbers only estimates minimum possible value, what we should look at is the numbers for 2011-12—where the amount of currency decommissioned was close to the stock of currency at the end of the year; it is unlikely that this decommissioning was a one-off. In other words, the total amount of currency printed each year is likely to be twice the amount of currency in circulation at the end of the year. This should add more perspective to the cost of decommissioning the high-value notes. Given the current demand for high-denomination notes, it will be expensive to get rid of them. The effort should thus be to first curb the demand for these notes, and there is no better way than to encourage electronic payments and move towards a cashless economy. IMPS (Immediate Payment Service) has already seen significant traction in peer-to-peer transfers. With the proposed Universal Payments Interface (UPI) coming into force later this year, there will be further incentive to avoid the use of cash. Widespread use of cash comes at a significant cost to the economy—not only does it encourage greater use of unaccounted fund, there is also a significant cost borne by the RBI for printing, authenticating, maintaining and distributing currency. In this context, there is a strong case for RBI or the government to provide people monetary incentives in order to encourage the adoption of electronic payments.